Columbia University students will dine with Iranian regime President Mahmoud Ahmadinejad when he comes to New York next week, it was announced today. 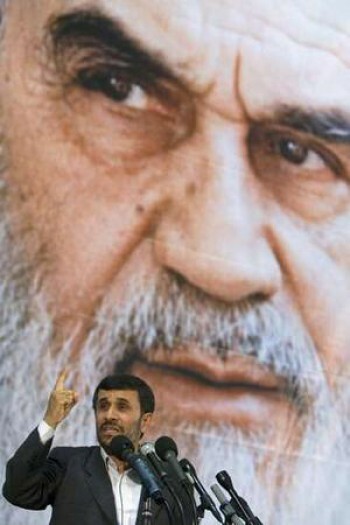 A group of Columbia University students is expected to attend an upcoming private dinner with Iranian President Mahmoud Ahmadinejad, who will be in New York City in September for the United Nations General Assembly, The Columbia Spectator reported. Fifteen members of the Columbia International Relations Council and Association (CIRCA) were invited to the Sept. 21 event in Manhattan, the newspaper said. The students will dine and speak with Ahmadinejad and Columbia President Lee Bollinger, who introduced the Iranian leader as “a petty and cruel dictator” when he spoke on campus in 2007. At the same 2007 event, Ahmadinejad lambasted Bollinger for what he called the “insults” and “unfriendly treatment” he endured from his host. CIRCA Vice President Tim Chan said so far he has not heard any concerns from the group about the upcoming dinner, the Spectator reported. “Everyone was really enthusiastic,” he said.